At times leatherjackets can be the scourge of both the estuary and off shore angler. They have been known as bait stealers and the piranhas of the sea. Many a time I have been fishing in one of the many estuary systems that I fish, only to have either my well-presented bait or soft plastic devoured by those pesky leatherjackets. Many an off shore angler will pull their hair out when they keep losing rig after rig after the leatherjackets have nipped the line, where a skerrick of bait has been left on the line. I can remember as a kid, my dad taking me on the weekend for a fish chasing leatherjackets underneath the Tom Ugly’s Bridge at Blakehurst in Sydney. We use to spend a few hours sitting on the edge of an overhanging rock pulling in fan belly, yellow-fin and chinaman leatherjackets while using hand lines on either Coke bottles or cork with a paternoster rig and small pieces of peeled prawns. Now days I prefer to use a rod and reel outfit off the shore or out of a boat. Over the years I have found that the trick to catching leatherjackets is to keep it very simple and the best rig that I have found that works is the paternoster rig. Leatherjackets are extremely masterful at getting the bait off your hook without you feeling a thing. 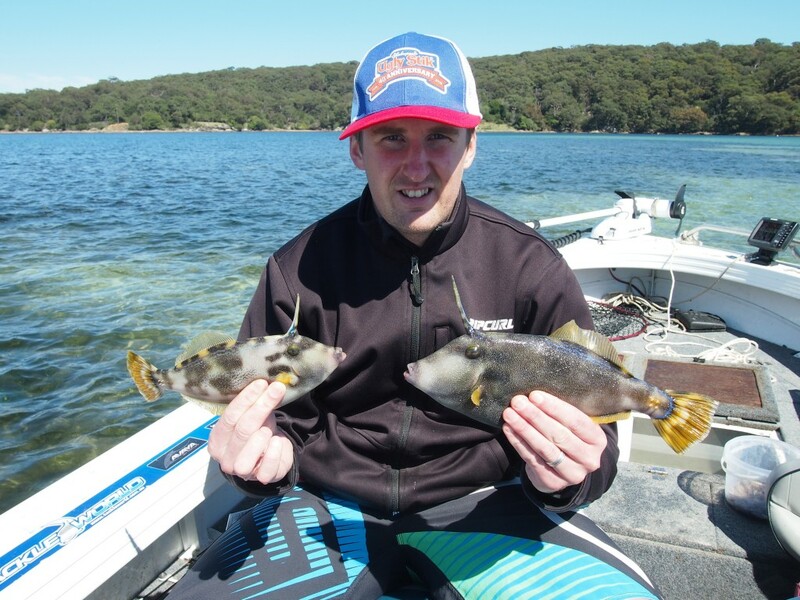 Think back to the times when you have been fishing for other fish species and all you have come back up with is the prawn shell, with no prawn meat inside or the squid bait that you have so carefully put on has now going without even feeling a bite. 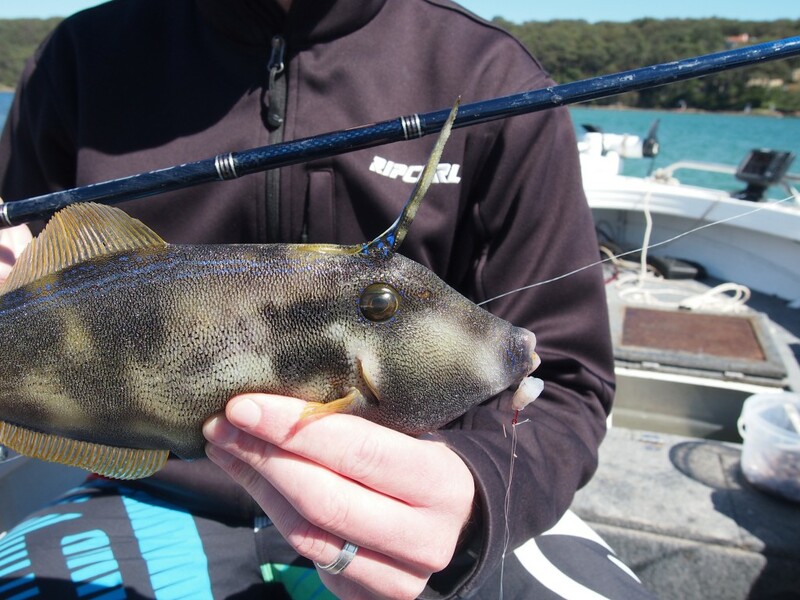 Whether you are fishing off shore or in the estuaries for leatherjackets there are a few tricks you need to have up your sleeve. Keep the bait size small, use a fast tapered outfit, make sure the leader length from the mainline is short, always feel the sinker weight by having it off the bottom, have your finger on the line for feel, watch the rod tip and don’t forget to berley. Get all this right and you will go home with a feed of leatherjackets. Estuary – Shakespeare Slingshot, 2.1 metre, 3 to 6 kilo rod with a Slingshot Engage 40 SZ threadline spooled with 3kg Fireline Exceed and 3 to 4 kilo Vanish for the leader. 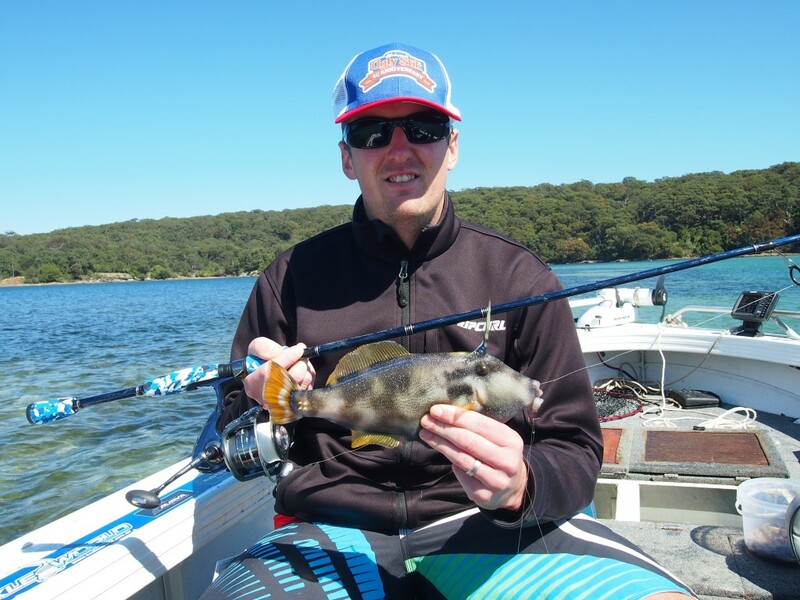 Estuary – Shakespeare Ugly Stik Platinum, 2.1 metre, 3 to 4 kilo rod with a Pflueger Trion 40 SW threadline spooled with straight through Berkley 6 kilo Sensei Fluorocarbon. Offshore – Shakespeare Ugly Stik Gold, 1.95 metre, 6 to 10 kilo rod with a Shakespeare Agility Saltwater 6000 spooled with 10 kilo Fireline Exceed and either a specially made up wire rig. Notice how the small No 12 hook and the small piece of prawn are the correct size for catching leather jackets in the estuary. Hook types for the estuary would range from size 8 to 12 long shank and size 1 to 3/0 Owner circle hooks for off shore. The sinker size will depend on whether you are fishing where there is current or no current and the depth of the water. All you need to remember is that there has to be a slight bend in the tip of the rod and the sinker is just off the bottom. I always use a swivel when connecting the fluorocarbon leader to the braid mainline. Whether you use swivels or a knot for the leader. I will leave that up to you. As for me I prefer to use either a spider hitch or a dropper loop. Peeled prawns are then cut up into to small bite sized piece for estuary leatherjackets. 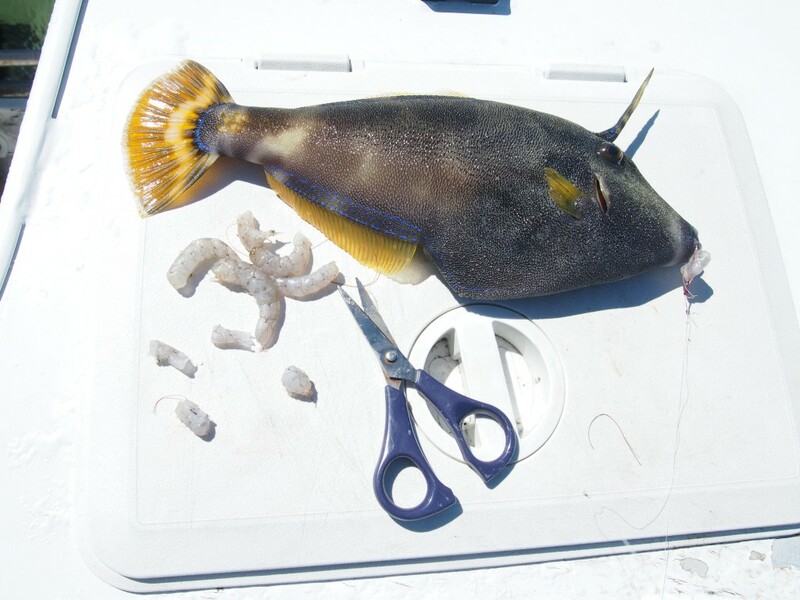 When targeting leatherjackets in the estuaries or bays you could try using small pieces of prawns, squid, octopus’ legs and tube, beach, blood and squirt worms. If using pieces of fillets, you will also need to keep the baits small (enough to just sit in the bend of the hook), but before using I would salt your tailor, pilchards, tuna, yellowtail, mullet or slimy mackerel. Now, as for targeting leatherjackets off shore you could use just about anything as bait. Try lightly salting your bait down for a couple of days before you use it. This will help toughen up the skin and the flesh while still keeping in the juices that you need to attract the leatherjackets. 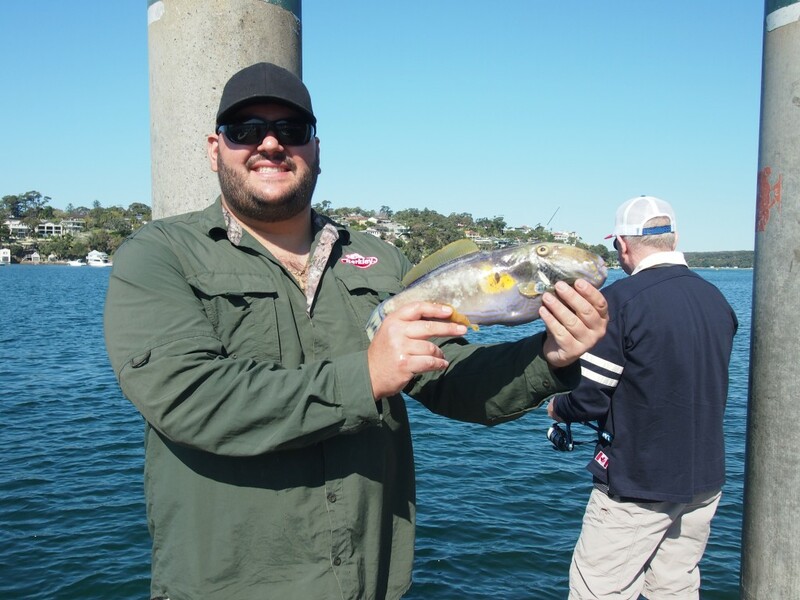 Andrew with a yellow-finned and four spined leather jacket that were caught over the weed bed in the back ground. When chasing leatherjackets, the main thing I found when using this rig is that you need to keep the overall length of the rig to about half the length of the rod that you are using and the the distance that the hook is away from the main line is no more than 12cm. Having it short will allow you to feel the bites much more easily. Sure you could use a sinker down onto the swivel and then a short leather, but I have found that the paternoster rig is the best by far.